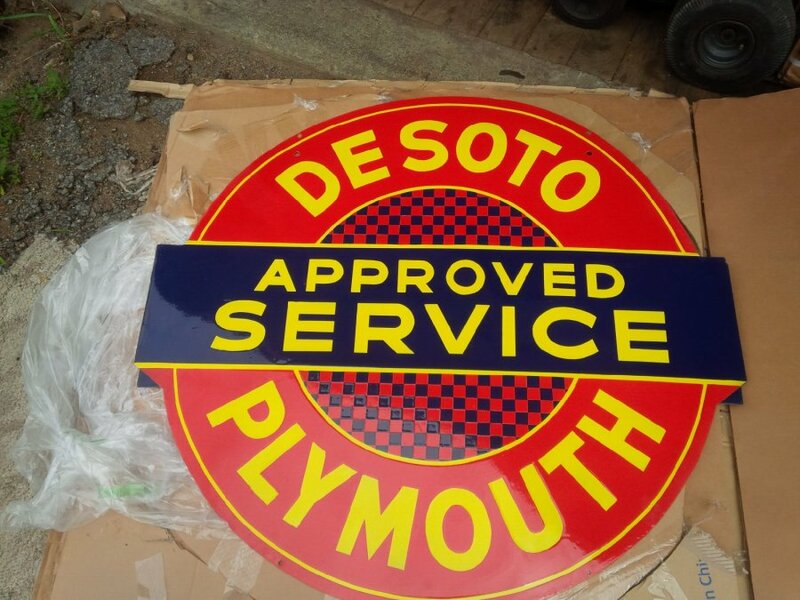 My Dads Original " 1938 Desoto/Plymouth "Approved Service" double sided porcelain dealer sign. 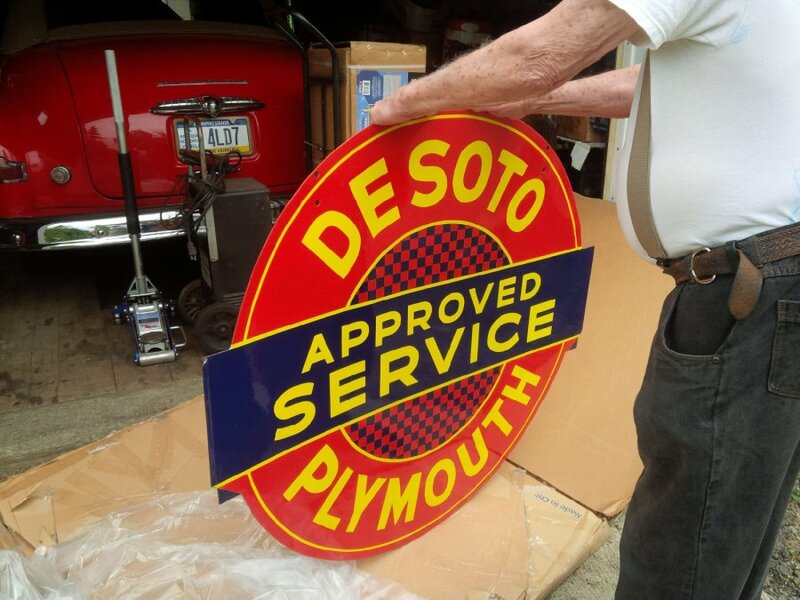 This was my Dad's original 1938 Desoto - Plymouth Approved Service Dealer Sign. 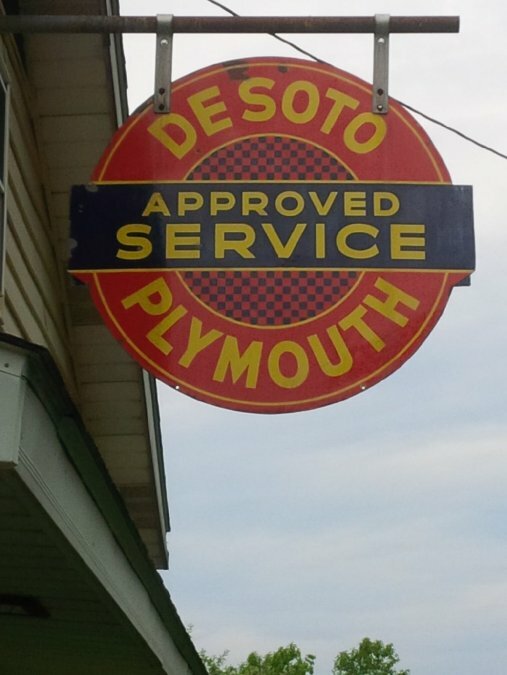 My Grandfather had a later Desoto- Plymouth sign and a Chrysler - Fargo Trucks sign hanging on the outside of his shop, which he built after he retired from Chrysler Corporation. It was a 42" sign and of course Dad always admired it. When Grandfather passed away the signs were sold at auction and the pair sold for $18,500 and after their sale Dad almost immediately started looking for one. Years later on his first trip to our friend George Asche's he smiled when he saw George had one hanging on his garage. 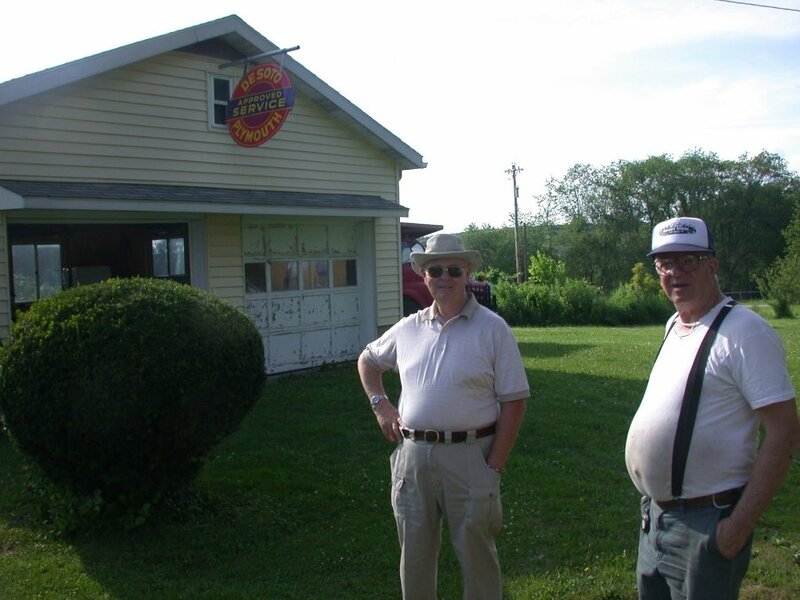 I took a picture of the pair of them in front of the garage and it became one of Dad and George's favourite pictures. The meeting of the Northern and Southern Flathead Mopar minds. 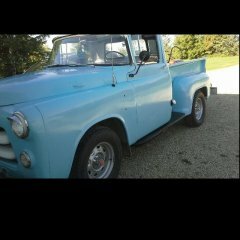 In any case, it would be about a decade later when Dad would finally see one come up for auction and of course it wound up costing more than did the one that sold at Grandfathers Auction. 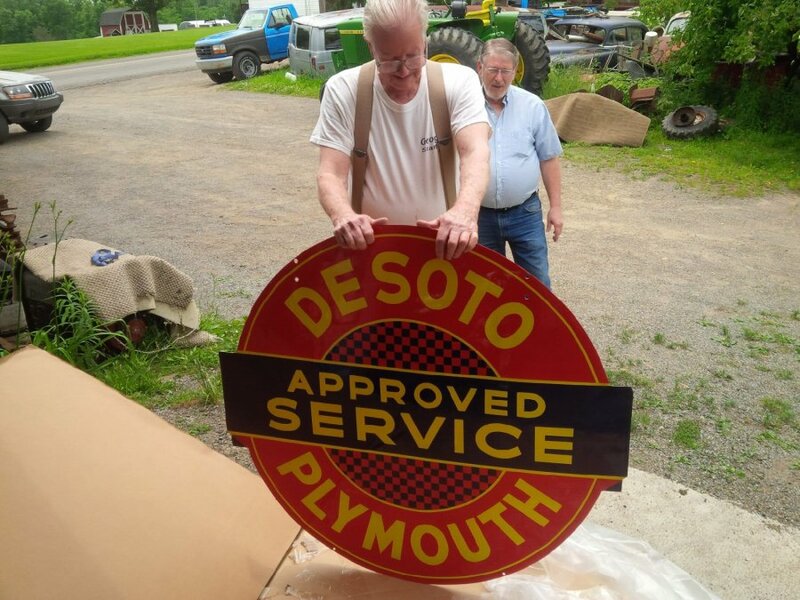 During the lead up to the auction it came to light that dealer sign was an original 1938 sign and as we checked out the sign measured it, and then compared it to the one that sold at Grandfathers sale, there was indeed a slight difference in size. Grandfathers was 42" and this one was 45". Grandfathers, well it had made its way back to Chrysler and was on display at the Walter Chrysler Museum. Given its age, it was in remarkable conditions when found (see picture of the pre-restoration sign) but after speaking to George who wished he had restored the enamel instead of painting its spots missing enamel, and speaking to the Curator at the Walter Chrysler museum it was decided to have it restored by the best we could find. 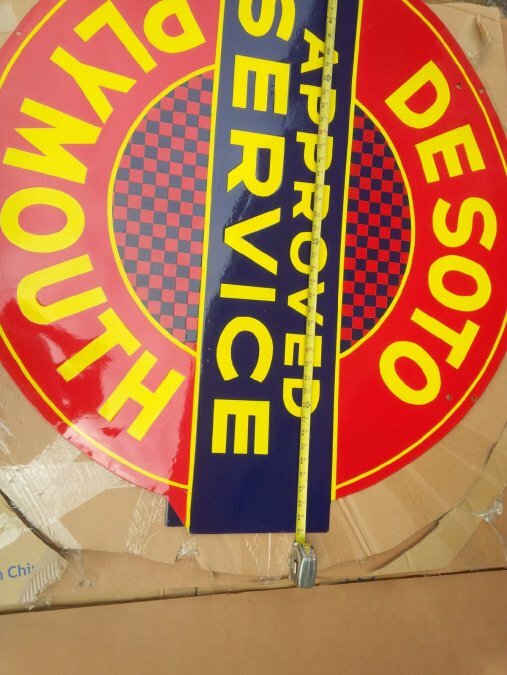 It underwent a world class restoration on the few areas that needed attention, by the leading enamel sign restoration company, Don Van Kannel - Van Kannel Sign Restoration and it is in absolutely spectacular condition. Sadly its restoration would take a number of years, and Dad would pass away without ever seeing it finished.  The family has wrestled with keeping it, or selling it. It had been appraised at $10,000 prior to it being restored and with the restoration cost, the imminent sale of Mom and Dad's place it really didn't make sense to keep it. So we put it up for sale and also consigned it to a large automotive memorabilia auction. We got a few people express interest, and a couple of trade offers, but nothing serious, so off it went to the automotive memorabilia auction with no reserve but a guarantee for the auction company on the minimum sale price. As our luck has seem to have gone lately, the sign appeared to sell at the auction for well above the guarantee the auction company had provided us. But a couple of days after the auction we were told that the buyer had failed complete the sale. Grrrrrrr, what else can you say. So the Sign today will go back up for sale, on Ebay and locally. We have put it up for sale at way less that we have in the sign, but it needs a new home and we would really like to see it go to a new home. The asking price is $7500 and that is pretty close to a firm number. We might consider a trade for something, but it will need to be something one of the family wants, and then they will put the cash into the estate. Next entry The Grand Master Turns 85 today ! Wow... Wow... Wow.. That sign is just stunning! I have a good idea what it took to restore it. I have also seen the sign at the Chrysler Museum about 20 years ago. I looked at real close and snapped a few pictures. It was no where near the condition this one was. One of the staff told me that signed was worth $25,000 easily. I can see the "Approved Service" Banner sticks out further one both sides that the one at the Museum. The little blue triangle at the bottom on each end are not on the one at the Museum. Bet that is the extra 1 1/2" on each side. With the prices I have seen at Barrett Jackson Memorabilia Auction I would have to think you could get 2 or 3 x what your asking if not more. It really is stunning.. I don't have a place to display it and I cant really afford it, but I am going to sharpen my pencil and see if I can pull it off. Email sent! Excellent sign, and double wow, what a piece of Chrysler History. I know 1 thing for sure, I can't afford it, ever, forever. I agree on the double wow. I have seen the signs pictures before and often wonder how come its not been snapped up. I have talked with my wife Shelly about a Christmas present, birthday present, 30th anniversary president, ground hog day present, anything. All I get is "downsizing" which gets a grrrrrrrrrr (to quote Tim). It was actually rougher than the before picture shows. It took a lot longer than I expected to get it done. It was extremely expensive but the finished product was off the hook incredible. The after picture they have doesn't do it justice. Which translates to when I see Tim's Dad's sign with all that checker board and being two sided I can only imagine the restoration tab. I may just have to load up the bride and go get her picture taken beside the sign and say Happy Anniversary. Hit or Smile ? may I suggest alcohol! Meaning best take your lovely and talented wife to a restaurant or bar and get her drunk before you pull the Happy Anniversary Stunt. If not, I predict - "Hit" or "Black eye" . I doubt divorce. If your rolling up on 30, which is close to 20 behind me, she has already realized all of your tricks and faults. I would love to see some one get this although just so you guys know my wife hasn't said no yet!